We’re pleased that one of our very own dentists was the guest on CTV Morning Live’s “Ask An Expert” segment on July 28, 2016. 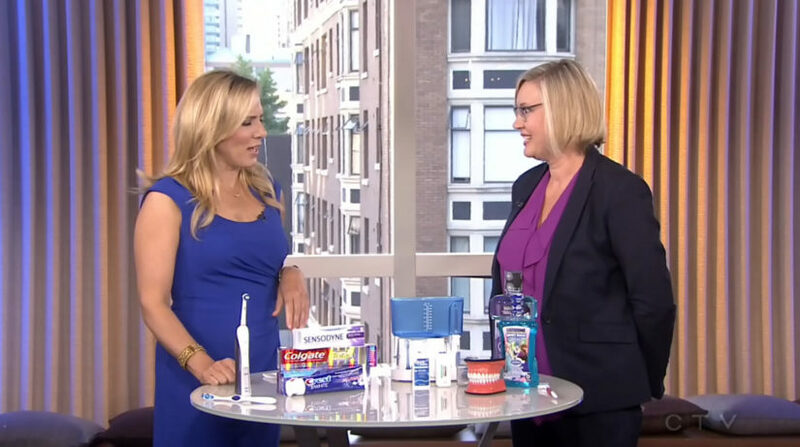 Dr. Alison Fransen, owner of Wesbrook Village Dental Centre, a dental clinic at UBC, provided tips for home dental care in a video segment with Keri Adams. Watch the video below, or you can read the transcript. KA: Did you know that 80% of the bacteria in your mouth is not on your teeth? Here to tell us more and show us how to keep your smile in tip-top shape is Dr. Alison Fransen from Wesbrook Village Dental Centre. Welcome Dr. Fransen. AF: Thank you. Glad to be here. KA: Thanks for being here. So we know that there is a lot going on, a lot of nooks and crannies in our mouth, so most of the bacteria is not on our teeth. So, where is it? AF: It’s on your gums, and your tongue, and cheeks, inside your mouth – all the tissues inside your mouth. KA: A breeding ground for bacteria? AF: Bacteria grow really fast too. One bacterium in 24-hours can multiply to 5 thousand-billion-billion (5,000,000,000,000,000,000,000) bacteria, and I think that’s about the number of cars on Vancouver bridges right now. KA: Unbelievable. That’s a scary statistic right there. Okay, all the more reason to make sure that we do things right when it comes to dental hygiene. So, first of all, let’s talk about the overall health of your mouth, and we have toothbrushes on display here. Does it matter what kind of toothbrush you use to clean your teeth. AF: No, if you enjoy using manual you can continue using one, just soft bristles are good – hard bristles are only good for cleaning the grout in your tile in your bathroom. KA: So, always go for soft. AF: Always go for soft, yeah. KA: Okay, well, manufacturers still come out with the other kind, so just go for the soft. What about electric? AF: Electric works really well. It has a higher rotation speed, so it takes away more plaque than a manual toothbrush, and it also has sensors so that you can’t press too hard – it stops rotating – and you can’t do any damage to your gums, like gum-recession and that. KA: It’s not something that’s necessary though, as long as you know how to use your manual toothbrush in the same way, then. AF: Yeah, as long as you’re gentle with it and you always brush downward – you’re not brushing the gum away from the tooth. KA: Okay, and you’ll show us how to do that in a second. Let’s talk about toothpaste as well. Lots of different ones on the market – are there some that are better than others? AF: No it’s just personal choice, what you’re looking for. There’s toothpaste for sensitive teeth, there’s toothpaste for tartar control, people who build up a lot tartar are prone to that. And then whitening toothpaste, and then there’s children’s toothpaste that are less foaming. KA: Do they all pretty much do the same thing? AF: Some of them are different – they have different ingredients – more polishers or peroxide for whitening your teeth, or the sensitive ones have a little coating that it puts on the root surface of your teeth so they’re not sensitive. Definitely different things, yeah. KA: Yeah, I have to use that. Okay, let’s talk about flossing – and I know that I always hear that you’ve got to floss every day – is it necessary to floss every day? AF: Yeah, it’s really important. Just brushing your teeth is not enough, you need to take care of your gums, too. Everybody wants a bright white smile, but healthy pink gums are a big part of the picture. KA: Is all floss created equal? AF: No, there’s different kinds. There’s ones for tight teeth that are really hard to get between, they have a real satiny, silky floss for that. Or there’s regular, or there’s a thicker floss if you have bigger spaces. And then there’s the Water-Pik, which is a water flosser – fill it up with water or mouth-rinse – anything like that, and then you start it up. KA: You basically fire water at your gums? And that’s the same thing as floss? AF: Pretty much. It’s like the pressure-washer for in between your teeth. So, you can adjust the pressure and you can really blast it out between your teeth. It does pretty much – it’s better than not flossing at all. KA: How important is mouthwash? Does this kill the bacteria in your mouth? AF: It takes it down to a lower level. It doesn’t kill it off. You can never kill all the bacteria in your mouth. But it takes it down, and it removes more plaque and staining than just brushing and flossing alone. So, I always follow up with that whenever I brush and floss. KA: It freshens your breath as well, too. Okay, and finally and quickly, but I want you to show how we should be brushing our teeth. We have this model right here, as well. AF: Okay, I’ll show you how to brush and floss. [Demonstrates brushing technique] So, on the top you always brush the gum down, because you don’t want to brush the gum away and cause gum-recession. Then on the bottom you always brush the gum toward the tooth – just gentle, not hard pressure. KA: I always thought circles were the way to go. AF: You can add a little motion and then sweep down. And then flossing, you want to take a long string,[Demonstrates flossing technique] about a foot or foot-and-a-half, wind it around your fingers and pull it tight tooth and get between every single tooth. And then you gently put it down and curve it around your tooth in a C-shaped motion back and forth. KA: Dr. Fransen, thank you very much. Great tips this morning. We’ll have nice bright smile before you know it.